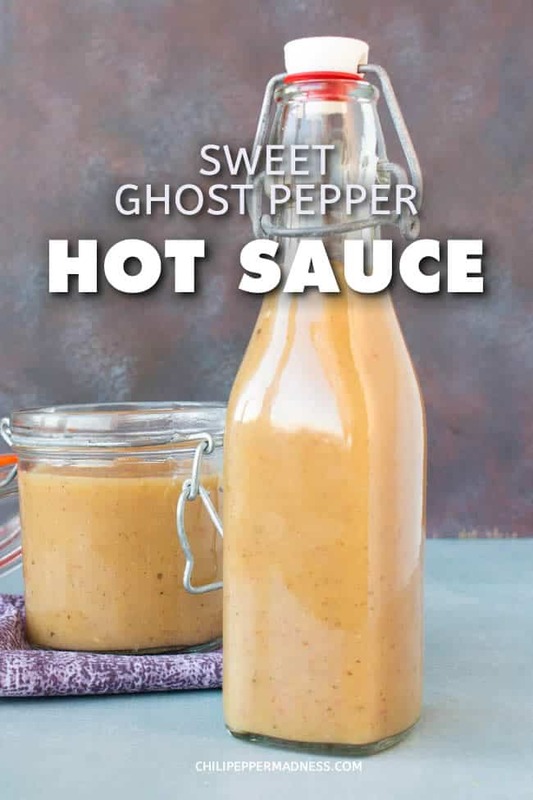 Make your own sweet and VERY spicy hot sauce at home with this recipe, which includes flaming ghost pepper chiles, sweet pineapple, pear, honey and seasonings. Ideal for pork, duck, or chicken. Once again it’s a HOT SAUCE sort of day in the Chili Pepper Madness household. Did you know we actually do not need a reason to have a hot sauce day in our home? Perhaps not, though I’m sure it is most likely obvious to you by now that I have a personal obsession with hot sauce and all things spicy. Truly, can’t help myself. 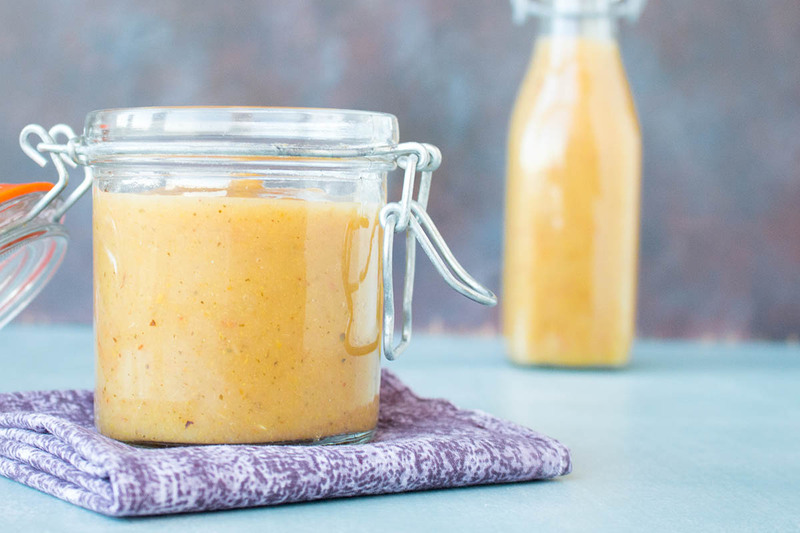 The story behind this particular hot sauce recipe is a bit strange, sort of a perfect storm of situations swirling around the drain of my brain, resulting in this particularly delicious hot sauce that, frankly, BRINGS IT! We’re talking hot sauce with GHOST PEPPERS, sweetpineapple, and pear. Yes, I said pear. 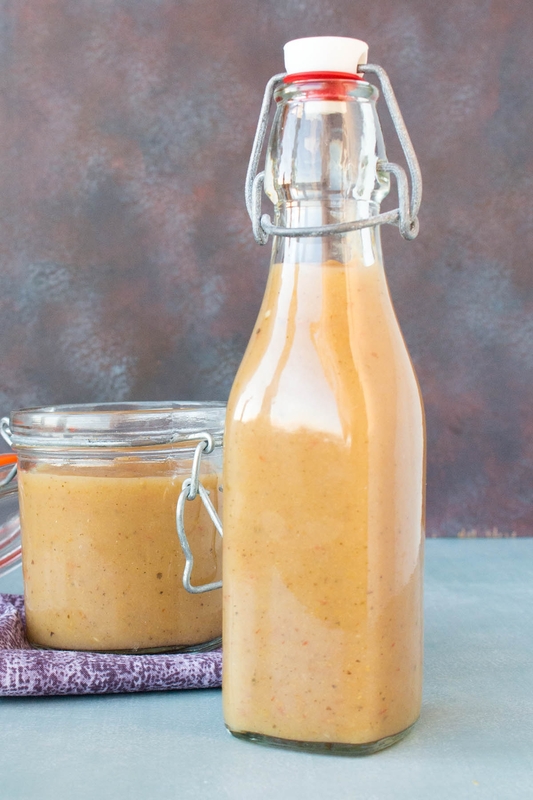 Like apples, pears bring a unique flavor and consistency that thickens up the hot sauce and allows it to grab onto your food. So! Here is the situation. We’re hanging out in Florida. I LOVE Florida, but hey, I like my hot sauce, too, so one of the first things I do is start gathering ingredients to make my own for daily use. First, we’re wandering through the grocery store (Fine, I was wandering, Patty was annoyed that I always take so long shopping for food) and I notice PORK is on sale. Like, ALL pork. Weird, right? I naturally gravitated to the pork tenderloin, which is always fabulous, and snatched up a couple loins. That baby was about to be cooked! BUT! I needed a sauce to go with it. SO! Here I am, next “wandering” the local farmer’s market where one particular table caught my eye. The PRODUCE table. Gorgeous! These guys had PEPPERS galore, so of course I picked upa large variety, including jalapeno peppers (DUH), long red fingerlings, serranos (YES!! ), and, amazingly, GHOST PEPPERS. I was like, what?? These guys have ghost peppers? Yeah, I was sold. Of course the pineapple caught my eye, mostly because they were screaming at me. Mike! We want to come home with you! I took the one that screamed the loudest. And you know what? PEAR. These guys had a section of pears spilled out along the table among the other fruits and vegetables, and as I stood there, I kept thinking about how perfecly pear goes with pork loin. I literally just wrote an article for Chile Pepper Magazine (Affiliate link! Haha! Get this magazine!) about pork called “Sweet, Sweet Swine” exploring the combination of “sweet” and “pork” and, hey! There you go. The combination of pear, pineapple and pork tenderloin is quite ideal, my friends. This particular hot sauce can go with more than pork, though. For me, it’s a white meat sort of hot sauce. Dash it over any pork, of course, but think about chicken breast. Also, I want to try this with duck. Not a white meat, I know, but I have a feeling it would be STELLAR. It’s a simple recipe. Mine lasted a couple weeks here. I hope you enjoy it. Let me know your favorite use for it! Check out my other Hot Sauce Recipes, too. How long will this sauce keep? It should keep a few months easily in the fridge, or even longer. It’s all about the acidity. To be technical, target level ph for shelf stable foods is below 4.6 ph, but should probably be lower for home cooks, around 4.0 or so, to account for errors. If you’re concerned, add more vinegar to lower the ph. Sauces made with fermented chili peppers will last even longer. Where’d you get that sauce bottle? I find them locally sometimes, but I also order through Amazon. Here is a link to some bottles I like (affiliate link, my friends! ): Swing Top Glass Bottles, 8.5 Ounce – Set of 4 . If you like the smaller bottles that most hot sauce makers use, here’s another link: Hot Sauce Bottles, 5 Oz – 24 Pack . 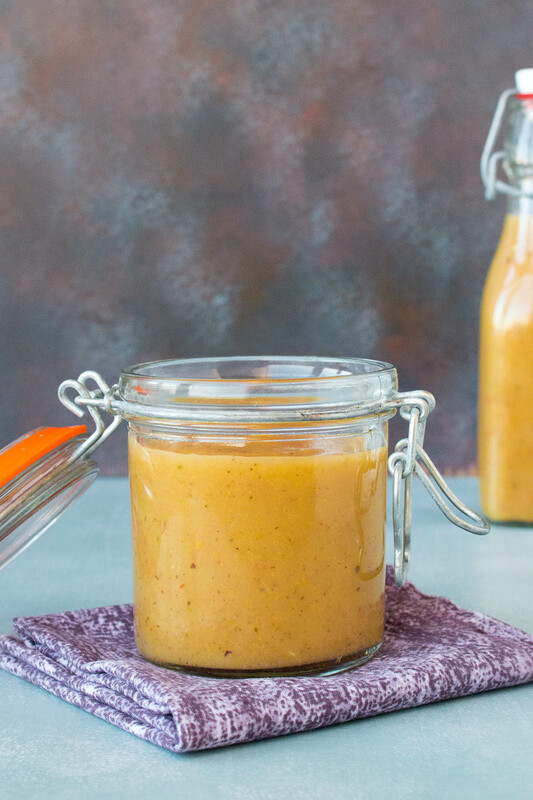 Can I process this hot sauce for longer storage? Absolutely. Just be sure to use proper canning/jarring safety procedures. What should I do with hot sauce? Aside from drizzling it over anything you please, here’s a post I did about How to Cook with Hot Sauce. As if you need even MORE reasons to eat hot sauce. I hope you find it helpful! When working with hotter peppers, including superhots, it is important to wear gloves when handling the peppers both in raw and dried forms. The oils can get on your skin and cause burning sensations. See above. Need help? How to Stop the Chili Pepper Burn On Your Skin. Also, the fumes from the chili peppers and/or the fine powders may get into the air if you are not working in a well ventilated room, so you may want to wear a mask and goggles. Superhot chili peppers, truly, are called superhots for a reason. Add everything to a large pot and bring the liquids to a quick boil. Turn down the heat and simmer for 20 minutes, until the entire mixture breaks down. Transfer to a food processor or blender and process until smooth. You can use this immediately or let the flavors mingle a day or 2 to intensify. If you can wait that long. Can I use yellow mustard instead of dry or Dijon mustard ? Or can it be omitted completely? Rachel, yes, you can use yellow mustard, or try the recipe without it. Let me know how it turns out for you. Question: do I have to had the dried basil? And can I use Carolina Reapers?Was hoping for a HOT Sweet sauce . Gretchen, you can easily omit the basil and yep, use Reapers instead. Let me know it turns out for you. Recipe sounds great, love the idea of using pear instead of mango. My concern is the shelf like, I make my sauce in larger quantities. What can I do to extend the life. Can you bath them in your jars for better preservation? Rick, yes, you can process the sauce in jars in a water bath for longer keeping. Check the ph of the finished hot sauce. If it’s 4.0 or below, it should be fine and should last quite a while without processing, though I think it is best to keep it covered in the fridge for longer keeping. I hope this helps. Just sterilise your jars before sealing and you should be ok, it works with most foods. As an extra safety measure you can use some aspirin (salicil-acetilic acid), you only need small quantities and it acts like a great preservative. this is a great recipe. used one carolina reaper and one smoked ghost pepper. fantastic resource you have here. Thanks, Col! Glad you liked it. I love the addition of the reaper. How much does this make? My Habs Ghosts are starting to ripen. First time growing Ghosts, and I’m looking forward to using them. Chad, this makes about 4 cups or so of final hot sauce. Good luck! I have Carolina reapers growing in the garden. I’d like to make this recipe. Go with one reaper as a sub for 2 ghosts? Mike, you could use both Reapers, or just use one and sub in something milder or even some extra pineapple if you need more substance. Heya, do you leave the seeds in? REPLY: Russell, yes, I do, though you can remove them if you wish. — Mike from Chili Pepper Madness. Can you use persimmons as a replacement for the pears? REPLY: Ben, sure thing. Give it a try and let me know how it turns out for you. — Mike from Chili Pepper Madness. REPLY: Keesha, yes, you can use milder peppers. Go with habanero, or even milder sweet peppers. — Mike from Chili Pepper Madness.